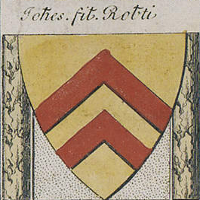 Who was John Fitz Robert? John Fitz Robert is listed as one of the twenty-five Surety Barons in the Magna Carta where he is described as Lord of Warkworth Castle. The Magna Carta (Latin for Great Charter) is a charter agreed by King John of England in 1215. It is notable as it is said to be the first agreement between a sovereign and his subjects on what the rights of are for both parties. In this case the subjects were the noble class or barons. The Surety Barons were responsible for guaranteeing baronial performance according to the charter. John FitzRobert is one of only seventeen of the original twenty-five sureties who have identifiable descendants. John FitzRobert is a descendant of Charlemagne, as well as France's King Robert I. As would be expected, John FitzRobert has a number of famous royal descendants including King Henry VIII and at least two of his wives, Jane Seymour and Catherine Parr. More recent royal descendants include Queen Elizabeth II, the late Princess Diana, and Catherine Middleton, Duchess of Cambridge. Some of John FitzRobert's American descendants include U.S. Presidents George Washington, Thomas Jefferson, James Madison, William Henry Harrison, Zachary Taylor, Benjamin Harrison, William Howard Taft, Calvin Coolidge, Herbert Hoover, and Jimmy Carter. Other notable descendants include Mayflower passenger Richard More, Civil War General Robert E. Lee, explorer Meriwether Lewis, and British Prime Minister Sir Winston Churchill.